There’s an old gnarled apple tree hovering over the well at Tulipwood. My great-grandfather built the well and he probably planted the apple tree too. It is a very moody apple tree. Some years it is full of low and high hanging fruit and my brother and I shake it and throw sticks at the branches until we get the nicest rosy fruits on the top and the wormy bits on the ground too. And other years is doesn’t produce much at all. As if it just doesn’t feel like it… as if it’s decided to take the year off. But it always returns a year or two later with fruit. No matter how many years we attached a zip line to it in order to jump into the pool. My great aunt Gray used to keep all the apples, even the ones with worm holes. She didn’t mind a little cooked worm in her apple sauce. It was protein after all. That was aunt Gray though. She was very Puritan in her approach. You can read about her in the very first paragraph of Food Heroes if you’d like. But I’m not spending as much time at Tulipwood these days or on the East Coast for that matter, and so I’m missing out on those magic weeks when apple picking season is at its peak, when the fall leaves turn and the apples are crisp and sweet and cold. Someone told me last week that Berkeley is one of only climates in the world that can produce both apples and oranges. And so I went apple picking in the area. A bit further north, with an old college friend. We were re-living our New England days… or at least trying to. 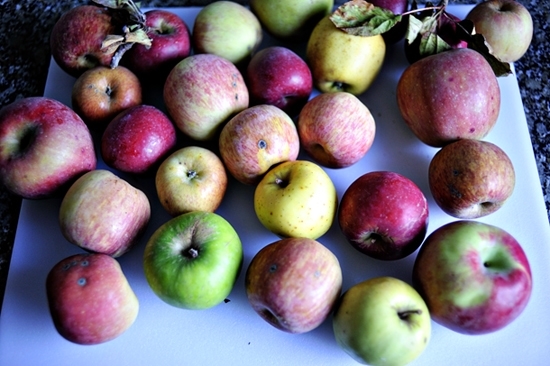 A melange of heirloom apples from an organic orchard… with requisite wormy bits. Except these were warm. Biting into them at the orchard was almost like biting into a pie. It was 104 degrees that day. And so my soul didn’t feel quite at ease. Apple picking is supposed to be done with a scarf on, isn’t it? When I spent time with Jon Rowley up in Seattle in order to write about him, I spent some time with him and his wife making pie. They spent many years perfecting the perfect apple pie and the key they found was in many varieties of fruit in a single pie. Heirlooms were ideal too. And in some cases, well-aged apples tasted even better than fresh ones. Variety is good because you get several flavors but also because you get several textures. It keeps things interesting. Golden Delicious, Granny Smith, Jonathan, Stayman-Winesap, Cox’s Orange Pippin, and Jonagold, all provide a good mix of sweetness and tartness. 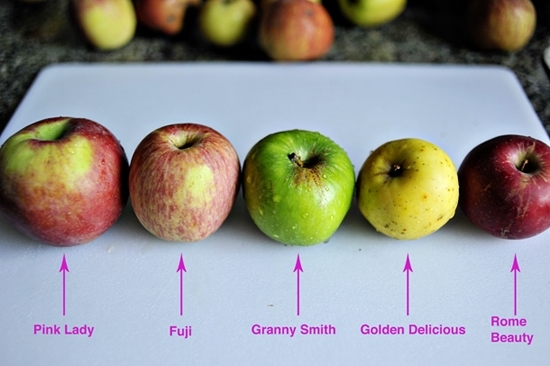 Other sweet choices are Braeburn, Fuji, Mutsu, Pink Lady, Suncrisp, Rome Beauty, and Empire. 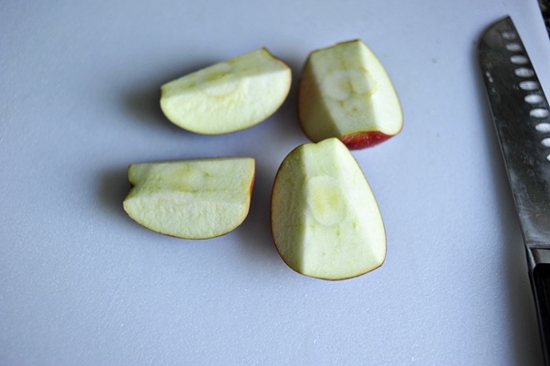 Good tart baking apples include Idared, Macoun, Newton Pippin, and Northern Spy. 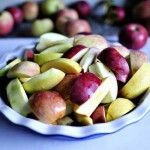 What you want to stay away from are too many apples that become mushy when cooked–like McIntosh and Cortland. A few are okay, just not a whole pie full of ’em. 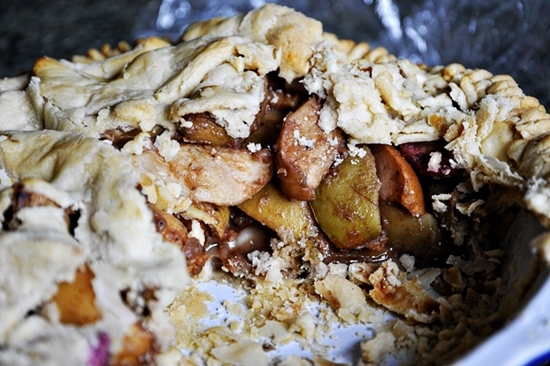 You’ll want to start off with 1 recipe for Pie Crust. I’ve had many crust and lard musings before. I’ll let you read about them at your leisure. 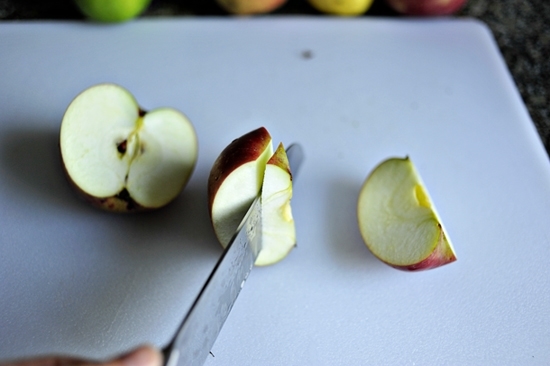 And while that’s chilling, you slice the apples. You take the cores out but leave the skins on. Then you’ll slice them another time or two. 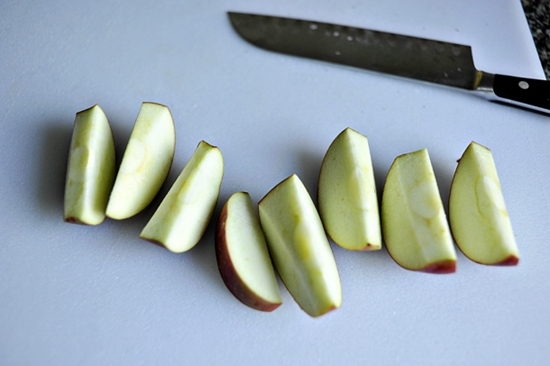 If the apples are very hard and a little less ripe, I might slice them a little bit more thinly. That will ensure they cook through. 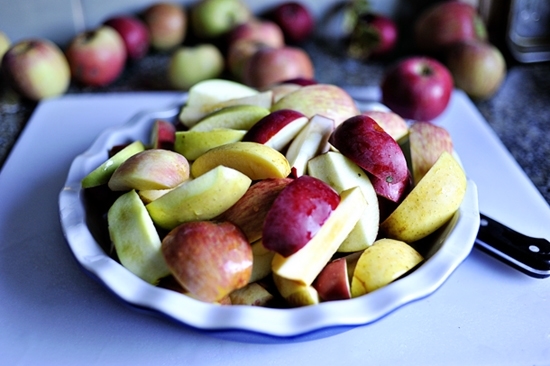 You’ll want enough apples to fit in a heaping pile in your pie dish. Here are some of the ingredients I use for apple pie. You can get creative here. 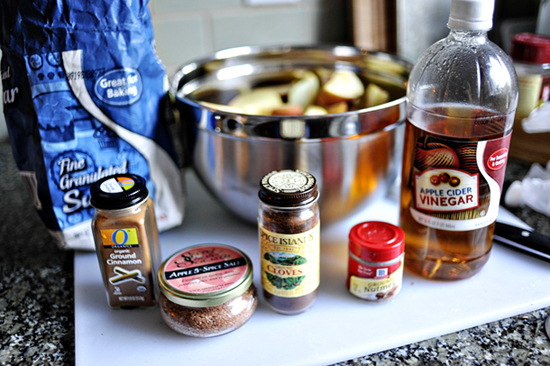 Cider vinegar, sugar, cinnamon, cloves, nutmeg, a bit of flour, and salt. I used this fun Apple Spice Salt that a fab girl named Janna gave me once in Seattle. Her company is called Secret Stash Salts and she makes artisan flavored salts to compliment any dish. Check ‘er out! Mix all of the ingredients together in a bowl until everything is coated. Dig deep to make sure you don’t miss out on any of the loose bits on the bottom. Pile the apples high in your crust. Also, try not to be like me and take a picture before the sun goes down. Florescent lights are my enemy. Also, I hate florescent lights. Also, my butcher gifted me a different kind of pig fat to try in my crust which is why it’s more crumbly than usual. It was an experiment he wanted me to try. And I like to conduct experiments when my butcher requests it. Especially when he incentivizes me with free fat. And my conclusion is to stick with leaf lard. I’m glad we talked about this. And there you have it. 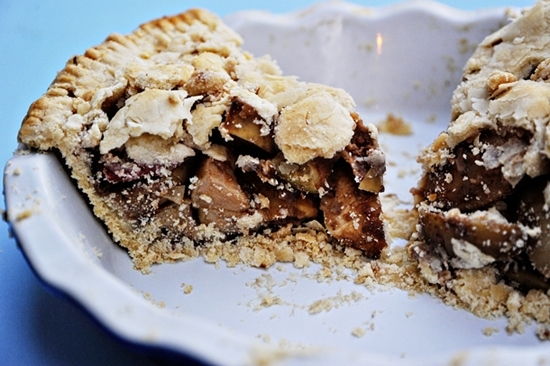 An heirloom apple pie. Give it a try sometime! It’s the taste of fall, and all of its good smelling air, and orange leaves and warm fires. Tell me, which food reminds you most of Fall? Combine all of the ingredients, except for the crust and egg white, in a large bowl. 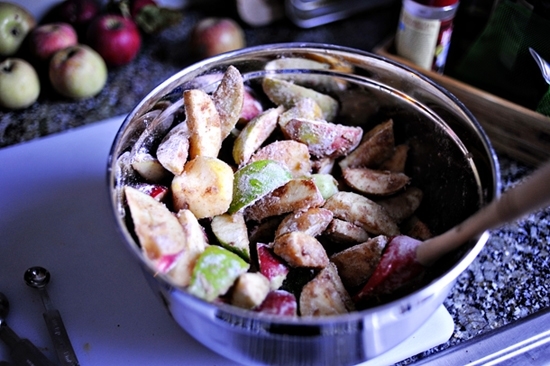 Mix well with a spoon until the apples are well coated, digging deep to get all of the loose bits at the bottom. Preheat the oven to 425 degrees F. Roll out one half of the pie crust and place in a 9'' pie dish. Pour the apple mixture into the pie dish. Brush the rim of the pie dough with a bit of water to help the top and bottom crust seal together. Roll out the second half and lay on top. 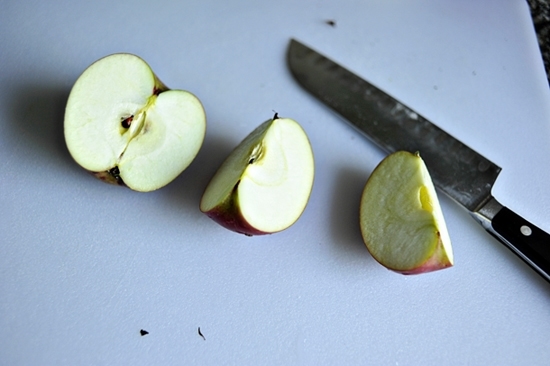 Trim the edges and crimp them with a fork, or give them a ridged look with your fingers. Paint the top with egg wash and cut vent holes with a knife. Sprinkle a little extra sugar on top if you'd like. Cook in the oven at 425 degrees F for 20 minutes, then reduce the heat to 375 degrees F and cook for 45 - 55 minutes more. Goodness gracious! YUM with a capital Y.
I'm intrigued by this pear idea. And then I thought you were going to say throw the squash in with the apple pie. And even though you didn't, I now want to throw squash in with the apple pie. I think I will. Watch out. 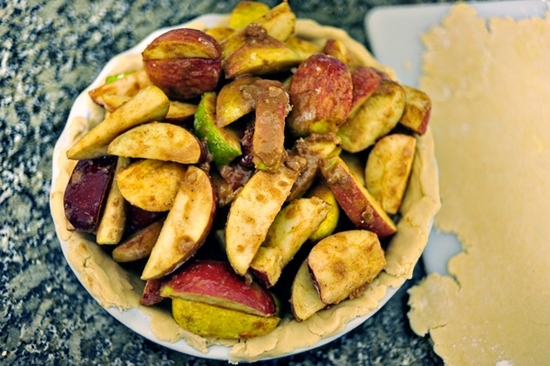 What a fantastic apple recipe. That pie looks absolutely decadent! I've got loads of apples this year from my trees in my garden, way more than I know what to do with. Thanks for sharing this recipe. The pie looks delicious! I am weddy for wabbit too. That pie would look even better lit only by the little light bulb by the water dispenser in the refrigerator door at about midnight! Favorite Fall Food… Living on the Texas gulf coast (can’t leave the good salt water fishing) and wishing we had an actual Fall season rather than simply summer giving way to our version of Winter after a cold front, it’s hard to really get into Fall down here. It’s a shame, as Fall is my favorite season hands down. Having spent time in Vermont and New Hampshire this time of year, I have to say the search for the best Clam Chowder I could find was one of my favorite food adventures. Year in and year out however, the food that most reminds me of Fall is a smoked sausage cassoulet that I’ve made since I first saw the recipe on the cover of Bon Appetit about 12 years ago. We have no shortage of deer and wild hogs, so using homemade andouille and venison smoked sausage have made this dish even more satisfying to make this time of year. I made this pie with pears that are similar to the apples described. I did cut out the wormy bits- ick!!! I did not have apple cider vinigar on hand so i used Balsamic. i used some lavender, cinnamon and sugar in the raw. For the crust- no lard in the larder so i used whole foods version of crisco. This is the most beautiful pie i have ever made. The crust is perfectly browned and flakey. Thank you for sharing. How wonderful! Thank YOU for sharing your lovely and captivating variations!